I am intrigued by the way the brain works; by all the assumptions, allowances and compromises it must make in order to negotiate the maze of everyday life. My special interest is language, and nowhere do we employ so much fuzzy computing as in the interpretation of words -- whether spoken or written. Fr xmpl, y r bl t mk sns, jst abt, f sntnc dprvd cmpltly f vwls. Your brain has filled in the gaps. It is helpful: it co-operates with an inexpert author in the business of communication. This is the way it has to be, or you would understand no more than a tiny proportion of the text you are presented with each day. If your mind operated like a silicon-based computer, it would baulk at the first misspelling or grammatical howler. An error message, or even a Blue Screen of Death, would be generated and that would be that. I have long been a private collector of literalisms. These are a species of lexical, rather than optical, illusion. Capable of more than one interpretation, they confuse the mind -- or at least the mind of one who demands adherence to the rules. I found the following pleasing headline in a local newspaper: TRADERS EXPRESS SQUARE FEARS. The story, obviously, was about the redevelopment of a shopping square, but I prefer the literal sense. Or what about this beauty, collected by that connoisseur, Mr Vladimir Nabokov, from an American paper? TORSO KILLER BEATS CHAIR. Literalism is the very substance of life for someone suffering from autism. Such a one, deficient in useful fuzziness, has great trouble dealing with the imprecision of others. "The imprecision of others" includes the baggy language used by politicians, many of whom are lawyers, know exactly what they are saying, and rely on our innate decency and helpfulness to draw the wrong meaning from their words. Our fuzzy brains enable them to tell lies while apparently speaking the truth, to confess failure while apparently applauding their own success, and to promise nothing while assuring us that our expectations will be fulfilled. Much bad writing is the product of laziness -- (i) and (iii); and of a wish to impress -- (ii), (iv), (v). Both these traits are lethal to the development of an authentic voice. The former earns the impatience of the reader, the second his contempt. He may not understand exactly why he finds a piece of writing turgid or preposterous; he just rejects it. 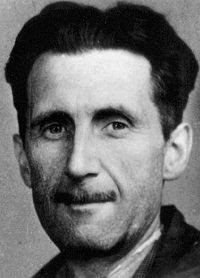 Orwell, with typical modesty, says that he himself frequently breaks his own rules. Any writer would have to be superhuman not to. Rather, he urges on us all, writers and readers, the need to analyse language, to develop the clarity of thought that only linguistic clarity can bestow. It is the most effective weapon against the lies of politicians. Orwell belonged to the British left. Unlike some of his contemporaries, he was an honourable man. He spoke out against Stalin, notably of course in Animal Farm, a book that the champagne socialist, Victor Gollancz, refused to publish. What Orwell would have made of Tony Blair and New Labour, of Gordon Brown and the quagmire of deceit in which British politics is conducted today, is easy to imagine. His essay belongs in the survival kit of every modern citizen.